A Collection of Special Christmas Ornaments which began in 2002, features each year a different historic point of interest in the City of Southport, NC. The ornaments are solid pewter and are produced by the Woodburry Pewter Company in Woodbury Connecticut. the centerpiece of each ornament is from the original sketches done by the late Donald (Don) K. Johnson, a local artist, for the Southport Self-Guided Walking Tour, available for visitors and residents alike at the Southport Visitor Center. Ornaments from all years are currently available. 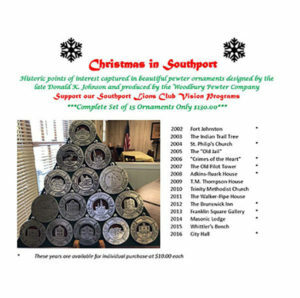 The proceeds from the sale of these ornaments benefit community projects supported by the Southport Lions Foundation, Inc., a 501c3 tax-exempt organization (EIN: 01-0790839). 65% of the cost of these ornaments is tax deductible. Copyright © 2018 Southport Lions Club All Rights Reserved.